A fairy of ice and snow from the Kitezh Gate. In the game's setting, Santa is not a single man, but an organization of many kind-hearted souls who take up the mantle for the sake of spreading happiness to the children of every realm. Ded serves as the headmaster in charge of training apprentice Santas at a school in Tokyo. A popular figure among his students, he watches over all of them with a warm, fatherly aura. This, however, is only one side of his personality. Ded has a darker personality lurking inside that rages as violently as any blizzard. His Sacred Artifact, the magical bag given to all full-fledged Santas, rewards kindness and good deeds with presents, but metes out punishment to the wicked in equal measure, and this dark side manifests by its own accord in the presence of evil. His power grows in proportion to the wickedness in his opponent's heart. Against an innocent, he's surprisingly weak. His kind, friendly persona views Youl like a son, and was the only one who supported the reindeer's dream, permitting him to become an apprentice Santa. The Dark side, however, is more akin to a drill sergeant running a promising young soldier ragged to draw out the latent potential that comes only from being pushed to the brink. 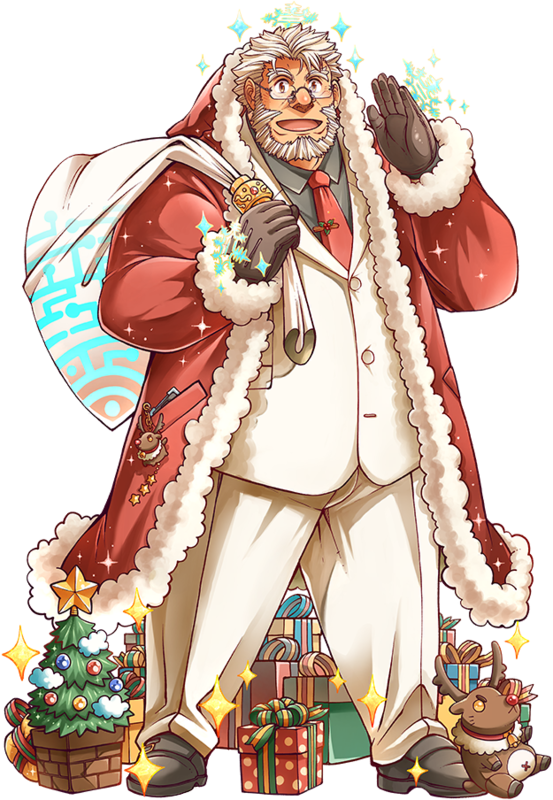 During the "Apprentice Santa's Gift" event, his Dark persona puts Youl to a test: Youl will be in charge of distributing presents to the children of Tokyo for Christmas as part of a sink-or-swim final exam. While being pursued by a ninja. "An ice spirit from the world of Kitezh, he is the bona fide Santa Claus. He is also the principal of the academy where the various Santas from the 23 worlds have gathered in Tokyo. He watches over his students like a father. But his rectitude is but a manifestation of one side of his character." "This half of his personality is the manifestation of the cruelty and harshness of snow and ice. The Sack he carries is a Sacred Artifact with the Rule of Causality, rewarding good deeds and punishing bad. In other words, when dealing with evil and immature opponents, this personality surfaces automatically and he deals excessive violence. However, he is extremely weak and vulnerable towards good and innocent folk. " =This personality is the one that shows his intensity, holding the harshness of snow and ice. The Sacred Artifact he possesses has the power to incarnate karma, rewarding good deeds and punishing misdeeds. That is to say, when confronting evil and immaturity this personality automatically appears and performs atrocities to the extreme. However, he is surprisingly tender towards the virtuous and pure. 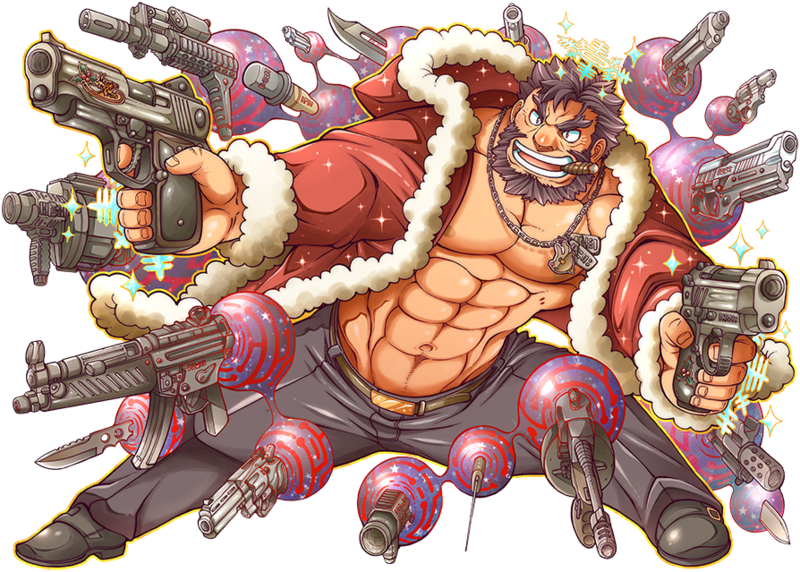 His full name is Ded Moroz (ジェド・モロース). Ded Moroz or Did Moroz is a fictional character who in some Slavic cultures plays a role similar to that of Santa Claus. The literal translation of the name would be Grandfather Frost. May also be a composite character of Santa Claus and his lesser known counterpart Krampus. Whereas Santa Claus rewarded good children with toys and gifts, Krampus was a sort of anti-Santa demon who punished bad children; varying from simply leaving garbage in place of presents, to abducting the bad children and dragging them to Hell depending on the storyteller. His Role is "Santa (Saint)" and his Rule is "Karma." Have I truly become a monster? This page was last edited on 4 March 2019, at 11:16.